Yes! The deed is done! we are finally getting settled into our new home. We have been whittling away at unpacking, room by room. 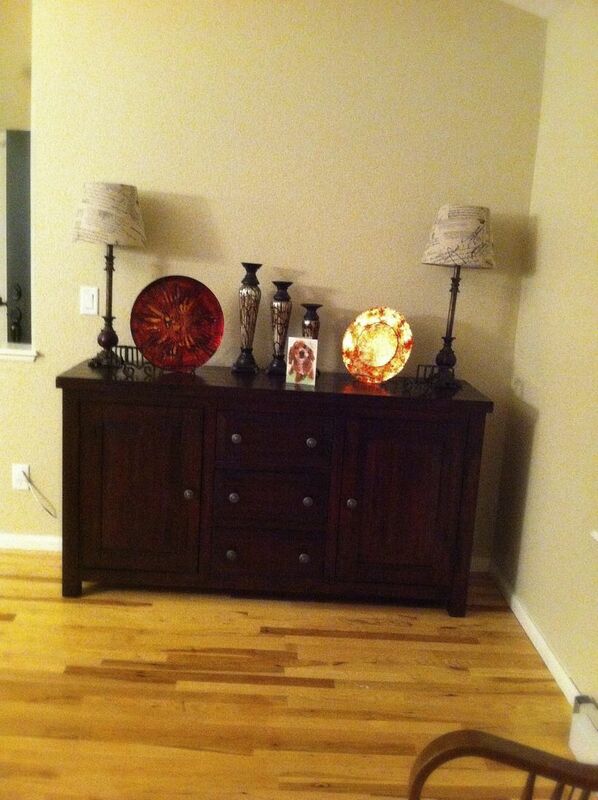 We also have been purchasing new furniture and other necessary items to make our new abode comfortable. I owe you all big and just let me know when I can return the favor! Now, how about a look at some of the rooms we have, sort of, in place? Puh-leeze keep in mind that it is all still a work in progress LOL! 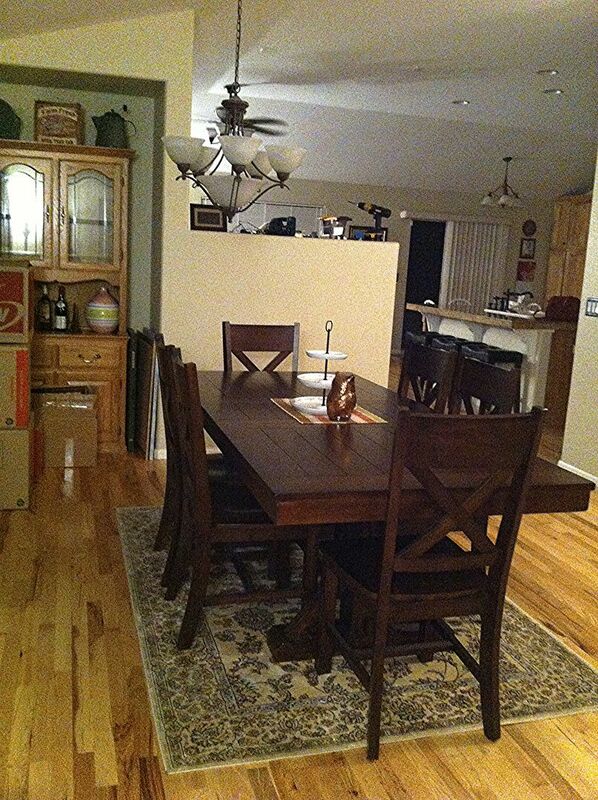 First up, has to be the dining room. You all know how important the dining room is to me. This room is HUGE! This is the far end, closest to the front of the house. The rocking chair will make its way to the guest bedroom once we get it cleared out (it's being used as our staging area right now) and a cozy sitting area will be created in it's place. and I am loving how bright they make everything feel! In fact, everything about this home is brighter which, makes it hard to get good photos until I get it figured out LOL. My beloved buffet sits on the wall by the knee wall close to the front door. I haven't chosen what I want over it yet but I love that it is no longer hidden by the dining table. Because the room is so big, I can finally extend the dining table to it's full length and will be purchasing 2 more chairs so that it seats 8. Bad news is, most of my tablecloths are now too short...guess that means I have to get some new ones right?? and I may have to look at getting a new rug or, removing it entirely. There is a niche behind the table that my china cabinet fits in perfectly! Love it! The "curtains" are actually cut from a big piece of fabric Ms K and I found at Goodwill on the day of the move. $4.99 minus my old lady discount and it was big enough to cut into 3 pieces to fit over the windows in the dining room. We have blinds ready to be installed and I have curtains due to arrive any day from Kirklands.com. I'll post an updated photo once they get in place. On to the kitchen, another room I just love! We had to purchase a refrigerator and I had asked for help on my Facebook page on what type to get. The votes were overwhelmingly for a french door style and we seriously considered it but, we were used to a side-by-side. This fridge is sooo much bigger than the one in our last home and we are both very pleased with our decision. One thing I am not in love with is the range. It is a Maytag double oven style and was left by the previous owners. I like the concept but, the bottom oven door is too low. So low that it hits my toes when fully open. Plus, imagine roasting a 15 lb turkey. You'd have to get on your knees to lug that baby in and out! I am living with it for now as it's there and it works and a new one isn't in the budget right now. All of the upper cabinets are 42" and I can only reach the bottom two shelves LOL! I plan on using the highest shelves for some of my dish collection that I don't need to get to very often. Another one of my loves is the island. I love that it is open to the living room. I'm also in love with the deep sink. One side is bigger than the other and I can fit a whole cookie sheet into it to clean. Every fixture in the house, hinges, knobs, shower heads etc. is oil rubbed bronze. I'm hoping that is still in style and, stays that way for a very long time or else we will have to win Lotto to replace it all! 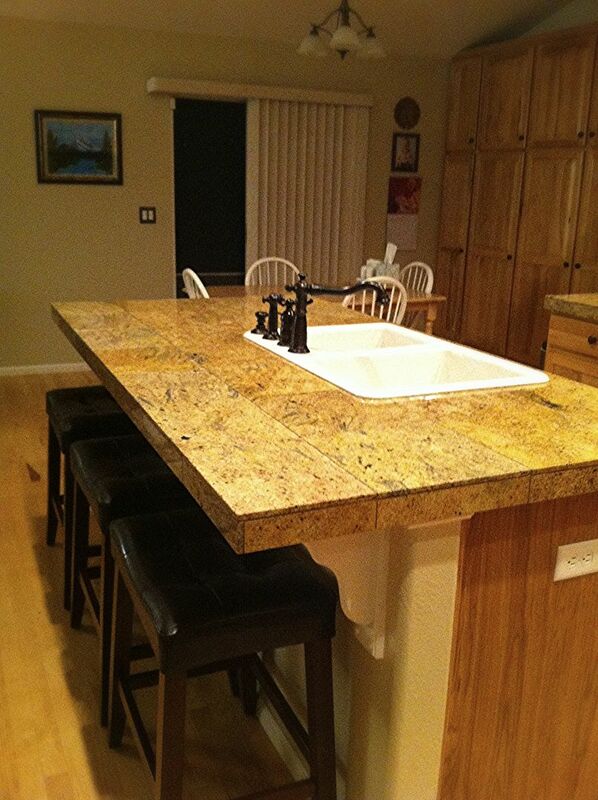 I've always wanted granite countertops and am pleased with the granite tiles throughout the kitchen. 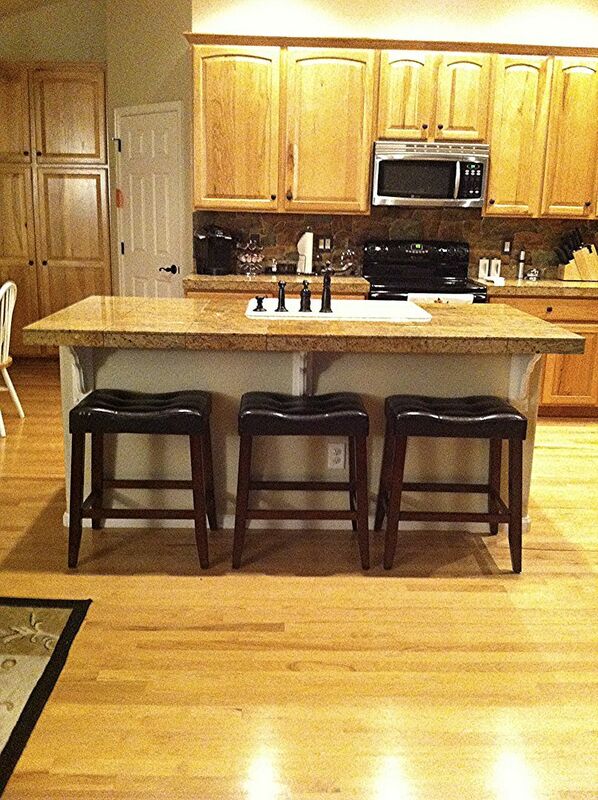 We chose backless yet, padded, stools for the island to keep the line of sight uninterrupted. These are super comfortable! The backsplash will be changed at some point too. It is handpainted to look like stone and, up close, isn't all that pretty. On to our little breakfast area. Now seriously! Who doesn't love a full bank of pantry shelves?? Again, I can't easily reach the top cupboards so, they will also be used for my tablescaping props. So far, I have everything organized by type with my baking supplies and boxed food on the left and canned goods on the right. I also have the canned goods separated by type; Oriental, Mexican, soups etc. We shall see how long I can keep that up. I forgot to get a picture of the pasta that is kept on one of the lower shelves in the upper cabinet but it too is pretty organized...for now. Next to the pantry cabinets is yet another pantry which I have chosen to use for all of my kitchen appliances and those tools that are just too awkward to fit in regular cabinets. 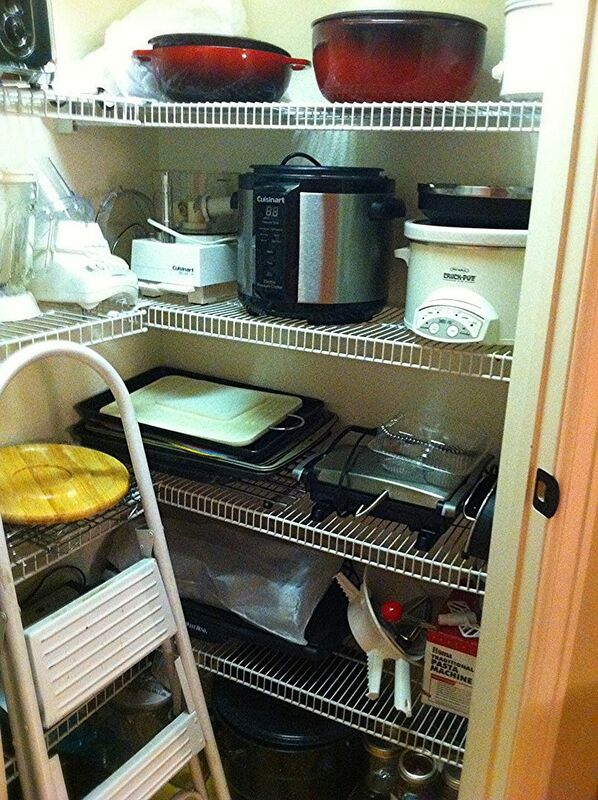 I am now able to easily access the pressure cooker, crockpot food processor etc. At the old house all of these were buried and a pain to get to. And, it makes for handy storage of my new best friend, my step stool LOL! That there ends the tour of the kitchen and dining rooms. For the first time in 10 years we actually have a living room with walls that we can place ample sitting in! 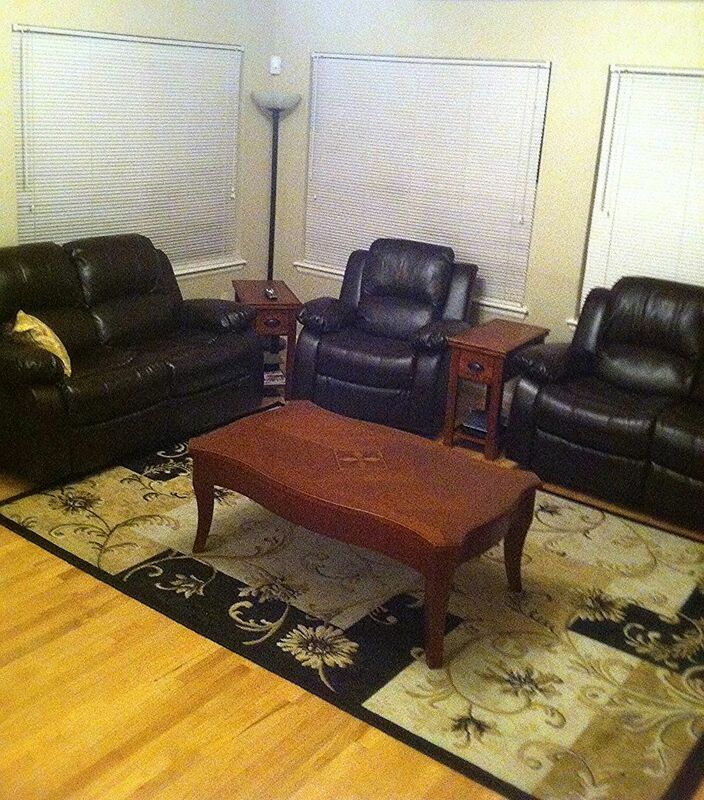 The two love seats and recliner are new as are the side tables. 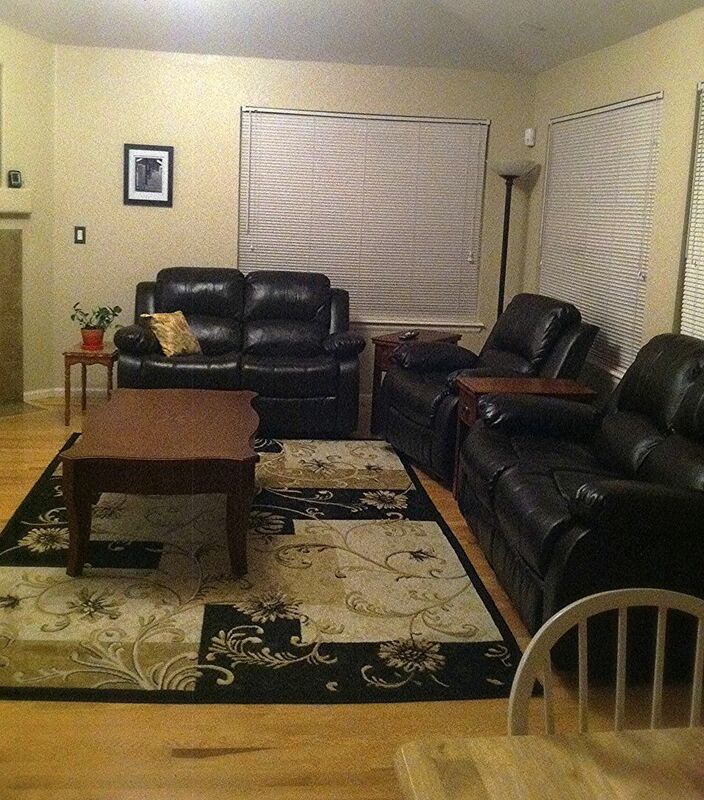 The huge coffee table will not be staying in this room and we will either get a smaller one or do without. The two back windows face north while the side window faces west. The sun really beats in that window as well as the two in the dining room so we have light blocking blinds up but are stumped as far as drapes go. We are not sure if we need them lined with blackout or, in combination with the blinds, can we go with plain lined curtains? Then, there is agreeing on a fabric/ pattern. I want to go a bit bolder (thank you other bloggers/ Pinterest & Houzz LOL) while Mr. B is more conservative. Separating the dining room from the living room is the fireplace and TV nook. Mr. B already has a bigger TV on his must have list and I am okay with that! I'm thinking this mantel nook is going to be so much fun to decorate for the holidays and general every day! That is, once I can get to my decor bins! So there it is. The main living areas of the new home! They will be, I am sure, ever changing as we nestle into our new nest. Be sure to come back Sunday afternoon when I will be sharing the HUMONGOUS laundry room, my office and the master bedroom. Nice, Kathe! Great kitchen and pantry especially. And as for the hardware, some things are just classic and it doesn't matter if the sellers of merchandise try to make us think it's not fashionable. Sounds beautiful to me. What a lot of work it is to move, but an exciting time too! Oh your pantries! I spent an hour the other day trying to re-arrange my cupboards because of all the big bulky stuff. I would kill for just the one! It's kind of weird how many things we have in common, I think my China cabinet is the same as yours. Mine might be a tad darker and the glass different but otherwise the same! 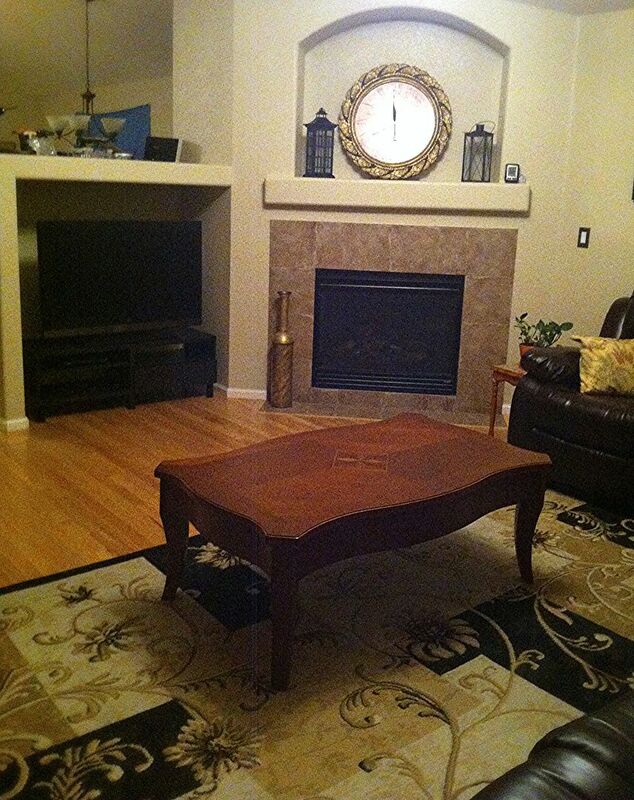 Thanks for sharing your new home, it looks beautiful! Kathe I love your new home! I am enjoying the tour!! Ooh I love your new home! It's sharp on the outside and on the inside too! So many nice features. I love all that storage in the kitchen area- really fabulous! I like rugs under the dining table but I think it looks fine either way. You can put felt under the chairs so they won't scratch the floor. 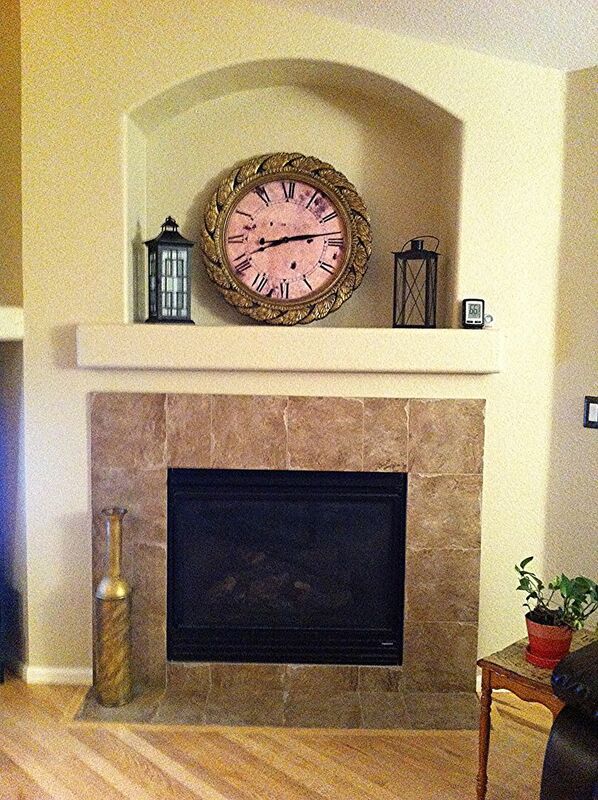 Nice fireplace! I have an arch too and I love it. We love our big tv- go for it! Thanks for the tour! I can feel how proud you are of your new home. It is just beautiful and I look forward to seeing it again after everything is in place and you have added your personal touches with decorating. Congrats on your new home Kathe! It looks wonderful. I know you must be so happy to be getting settled in. Thanx for sharing at THT. Kathe, it's just gorgeous! I can just imagine the fun you and Mr. B are having! 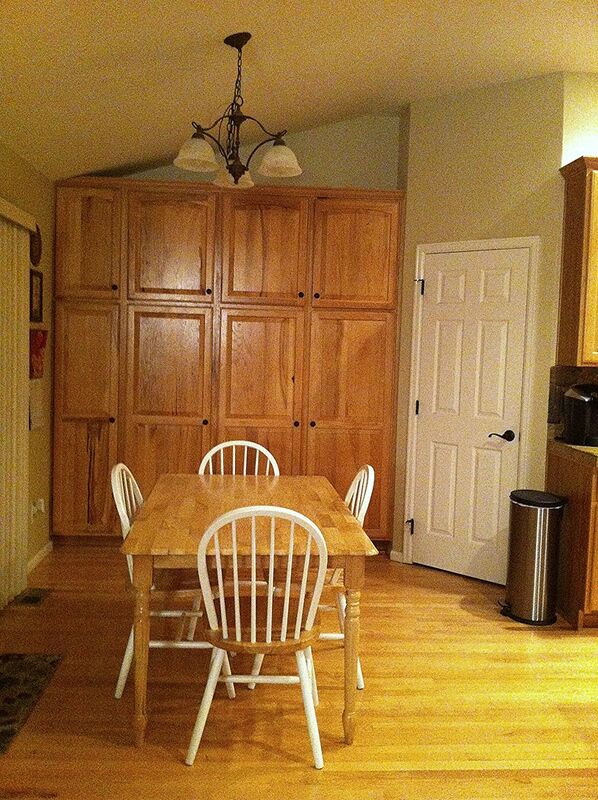 I would love to have that walk-in pantry. My bread machine has to live in the basement! Can't wait to see more!!! Hi Kathe, congrats on you new home! It is so beautiful and big! I love the kitchen and all your cabinets and everything that you have shown me. It looks so nice and wishing you and Mr. B lots of happiness and new memories. You have done so much already and I am amazed. Take care and enjoy the rest of the week. Moving is such a chore, but it comes with the promise of a brand spankin new start. It will all be worth it and it's going to look beautiful! Looks great! I love that buffet and the table. So great. I'm glad you're getting settled! You will have a great time getting it all put together. Congrats! Love your new place, Kathe :) Congrats to you and Mr. B! Such a pretty new home! I love it - so open and pretty. It is a great blank slate for your creativity! Oh my goodness, I LOVE your new home. I am jealous over that floor!!! Lovely. It is all looking just lovely. 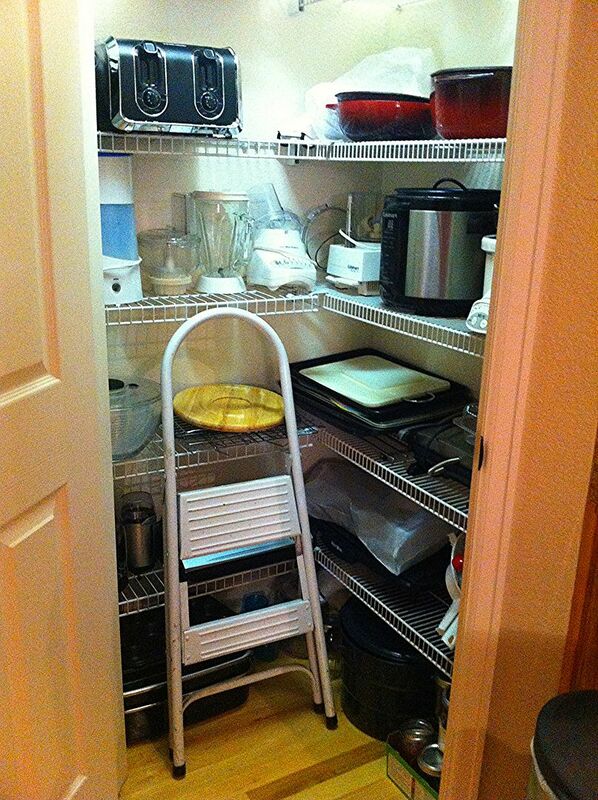 I could just die for a dedicated kitchen tool pantry. While packing up I found stuff I didn't even remember having! We just moved too, so I can relate to many things in this post (especially wondering how long the pantry will stay so organized...) Your new home is beautiful. Congratulations Kathe. Your new home is lovely and you are going to have so much fun decorating. As far as the rug in the dining room... I'm a huge fan of wood floors, but I think they need rugs. By the looks of it, you now need a bigger rug! But those are so fun to shop for! Just make sure it's one of the child-labor free rugs. Congrats on your new home Kathe!! Its beautiful! maybe we are just messy eaters... LOL! its porous and will soak up any spills and then you are stuck with a stain. It is so much fun to see where you live. It is beautiful and so organized. Thank you for sharing Kathe. Kathe it is good to hear from you and the new house is coming along. I hope you get settled soon. No one enjoys unpacking. We will be doing that in about 7 months. I can't wait to see more and yes oil rubbed bronze is still in style and I think it will be around for a bit! Congratulations Kathe! It is lovely and I we can't wait to see what beautiful personal touches you'll be adding! Congrats!! What a beautiful home!!! Sky's the limit to make it yours! Congratulations, Kathe, on your new home! You've certainly have some fun decorating places to decorate, especially in the kitchen. 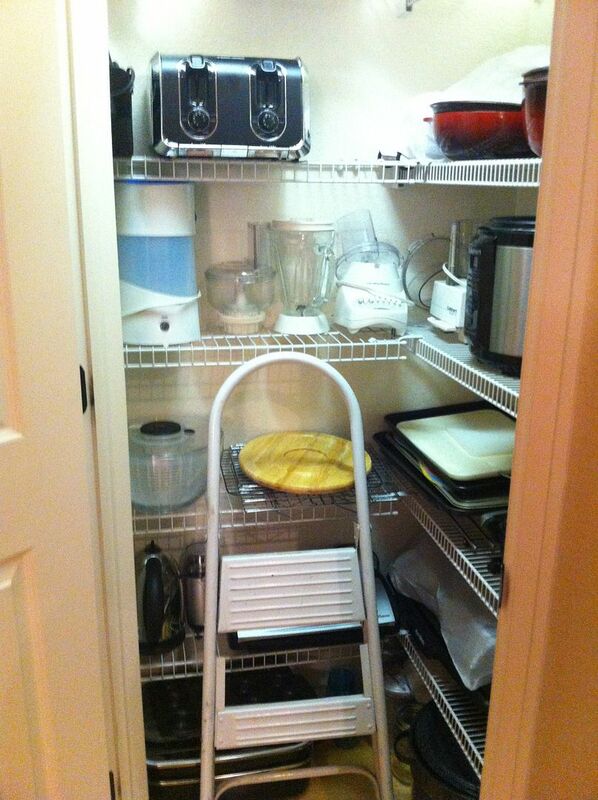 I've got those tall upper cabinets, too, and have to keep a stepstool handy. 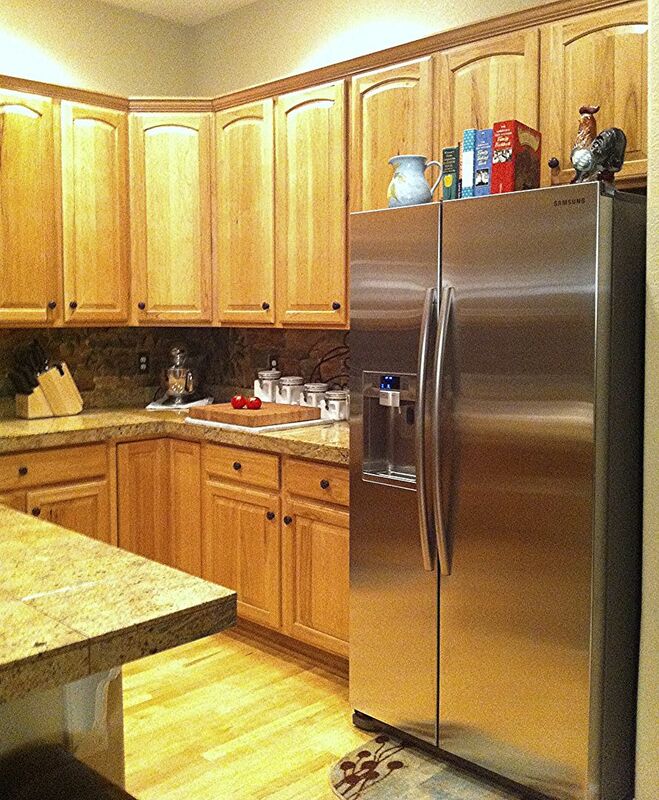 You are going to love having all that wonderful space above the cabinets to decorate. Your new home is G-O-R-G-E-O-U-S Kathe! I know you're excited to give it that special touch to make it your own, and it looks like you've got lots of fun features to work with. Thank you so much for sharing with us. Hi Kathe! I'm so proud for you and your new home is beautiful! Those floors are just gorgeous and I'm envying them a bit. 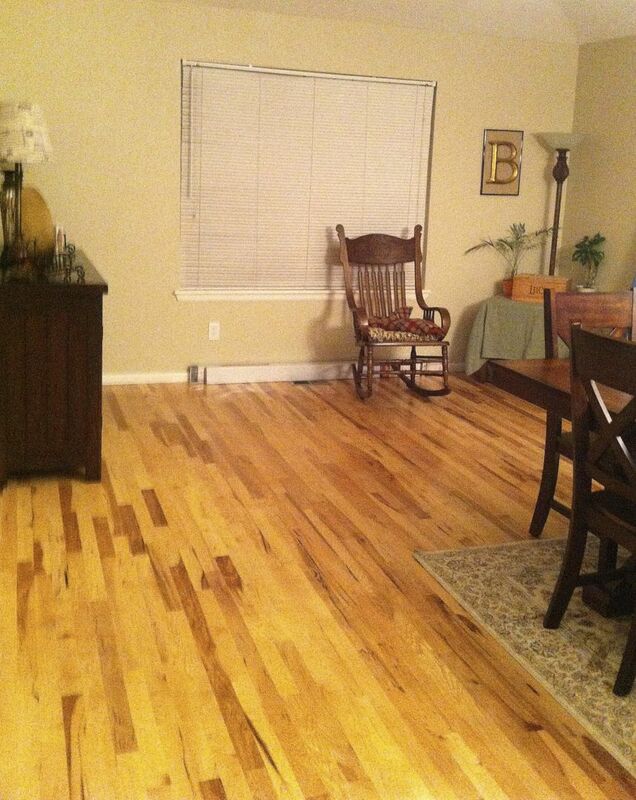 Always wanted wood floors. Love seeing all of your space and your kitchen! ;) I understand about high places and I have stools all over my house so I can get to things. Can I come cozy up to your island with a cup of coffee? Your stools look so comfy! You new home is just gorgeous, Kathe. And a fireplace! I love it. You are going to have so much fun. I'm so thrilled for you. Just lovely Kathe - a huge congratulations!!! 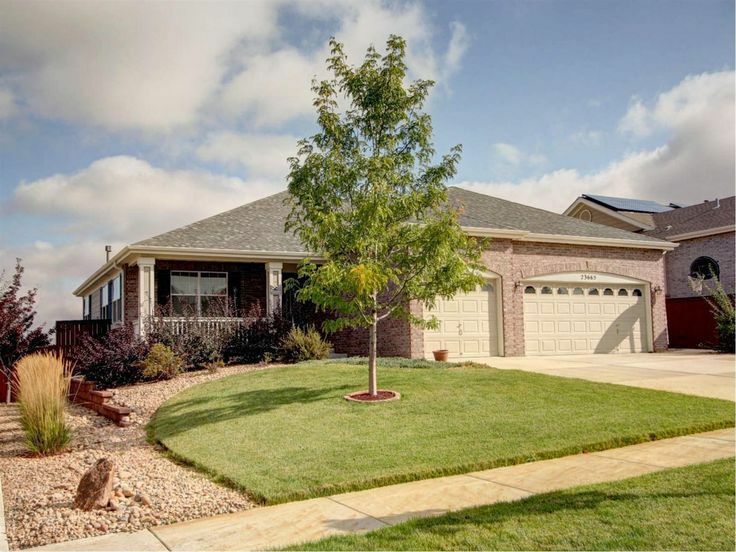 Congratulations on your new beautiful home, Kathe! You have a lovely home. I have pantry envy. Oh Kathe, I love your new home and I agree with Ms Lemon. I could die for that pantry and storage space. Congratss Kathe, looks like you have good space to work with. Love the two pantries, I think you will need a much larger rug and you have the space to support it. Good luck, keep us posted with your updates. Well, you are going to be busy for a while, aren't you? I am so jealous of all that storage! You asked about the rug -- I think if you are going to use one, you do need a bigger one so that all the chairs are still on the rug when pulled back. You could use that one you have over in that corner where you want to create a cozy area, or maybe under your breakfast table? It looks like it would fit there. Good luck in your new home, it looks beautiful! 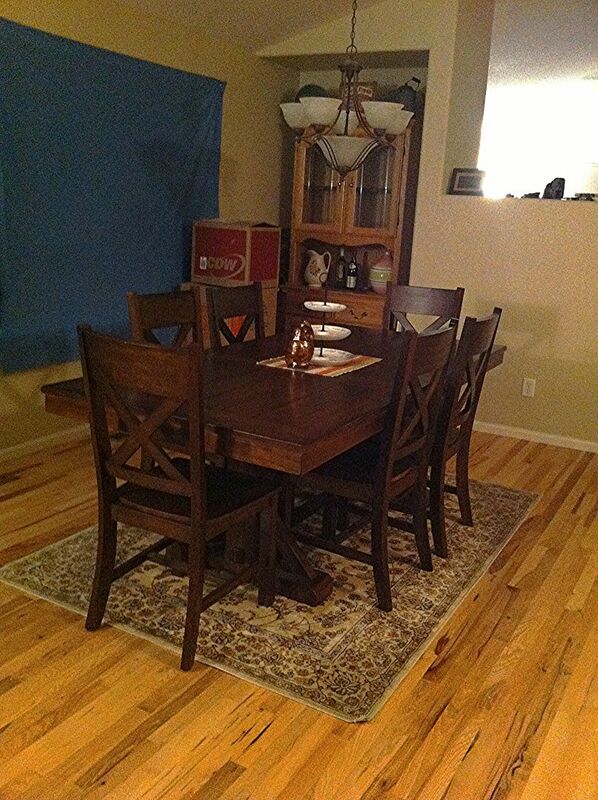 I still remember how happy ypu were to have a dining room set in your old house! A big congratulations to you its such a relief Im sure and so exciting a new home to decorate and make your own! Kathe, your new home is beautiful and I'm so jealous of your pantries!!!! They're absolutely fabulous!!! Congratulations on your new home. I also love your new bar stools! Where did you find them? Hi Susan, we purchased the barstools at a local home furnishing store, American Furniture Warehouse. They deliver all over the country if you would like to check out the website at www.afwonline.com. moving is always a huge work!!! But once it's done and we have everything in place, it feels SO good to be home! Thanks so much for sharing this with me at Bewitch Me & Titi! Hope to have you back with more amazing shares! Hope you are having a marvellous week!!! Kathe your new home is just beautiful! So happy for you! Congratulations! What a beautiful new house! 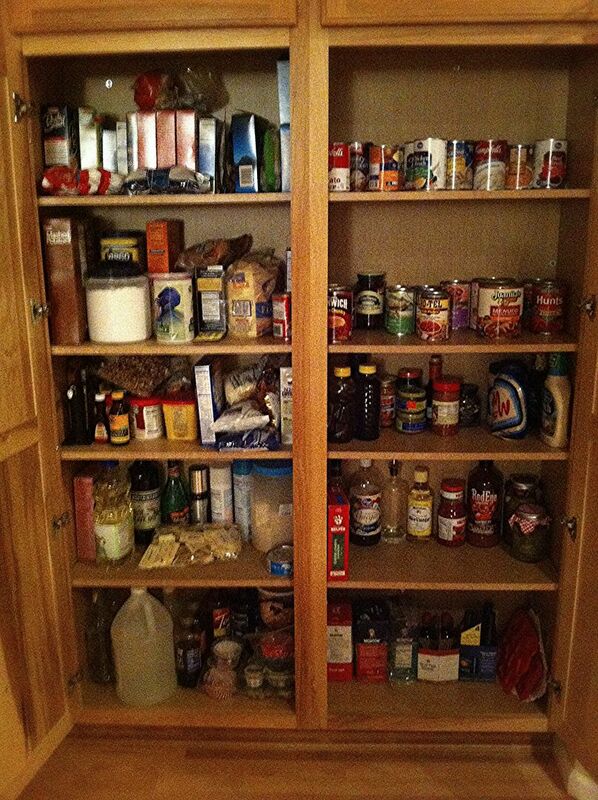 :) I love your pantry! That must be awesome! Visiting you via I Gotta Try That link party. Thank you so much, Kathe, for the information on the bar stools! Congrats! I am sure you are so excited to move into your new home. New homes are always so fun and full of potential. Can't wait to follow along. Thanks for stopping by the Pinworthy Projects Party! Beautiful!! Congrats on your move! Thanks for linking up at the Pinterest Power Party!! Have a great Wednesday! Congratulations on making it in Kathe! Always such hard work. I am so envious of your pots & pans pantry - I could so use one of those! Kathe, I love your new home and all of your storage spaces! I saw your fabulous laundry room which made me curious about seeing more of your lovely new home. Don't know how I miss this post but am so glad to see it now. Have fun decorating as I know you will! Really pretty! Love that island! Love the new home. Can't wait to see it in person. Sean says you're getting close to the reveal. Awesome! You are going to be very happy there!! Congrats! 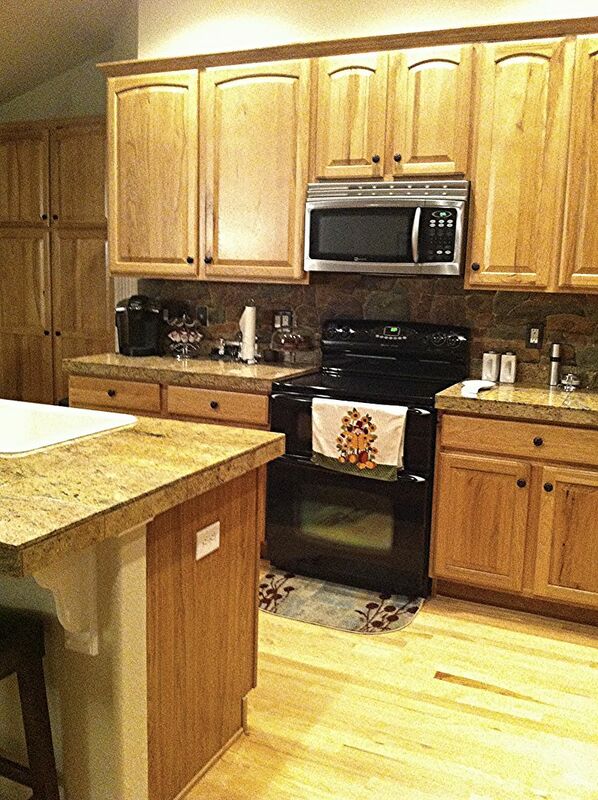 Your kitchen is the perfect shape and size! I love all of your pantry space. Sigh, one day.... Congrats Again, It is beautiful! On the windows in the living room, please don't go bold or you will end up with a heavy and clutter look to that corner....especially since the furniture is dark.